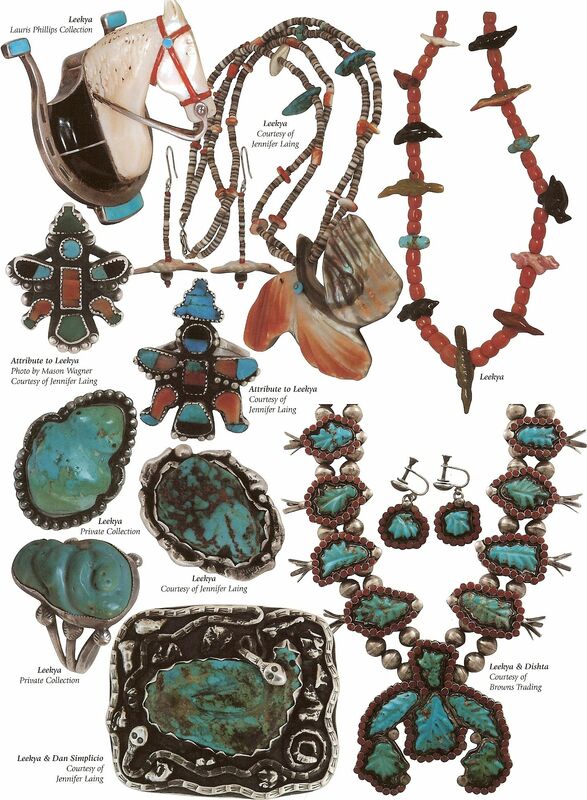 Zuni husband and wife Robert and Bernice Leekya are known for their bold turquoise (usually Kingman) nugget jewelry. They have been making it since 1953. Here I will showcase some examples of their work………. Born in 1934, Robert was taught by his father, a master Zuni jeweler Leekya Deyuse. Here are some examples of Leekya Deyuse’s work – he is often just referred to as Leekya. Born in 1889, he remained active in his craft until his passing in 1966. Bernice Leekya, born in the 1930s, was formerly a maker of cluster work. After her marriage to Robert, she worked with him on the nugget jewelry also. Robert shares the RLB stamp with his wife Bernice Leekya. The larger L extends below the B. This entry was posted in Authenticity, Bracelets, Buckles, Cluster, Concho Belts, Cuff Bracelets, Hallmarks, Kingman, Native American Tribes, Navajo, Rings, Robert and Bernice Leekya, Silver, Sterling Silver, Turquoise and tagged belt buckle, bernice leekya, bracelet, cluster, concho belt, cuff bracelet, hallmark, kingman, leekya, native american, navajo, robert leekya, sterling silver, turquoise by Native American Jewelry Tips. Bookmark the permalink. Very nice post! Much thanks. Did they not also construct several bolo ties? Only wish you had shown some examples of these also. Your photos give a better appreciation of this jewelry, really an art form. How special it is to have this as part of our country’s culture. Thank you. And that’s what makes handling this jewelry so interesting – it is all hand made and unique ! A very special part of our culture and we are glad to see in many families, it is being handed down. Could you possibly do an article on the care and storage of turquoise and silver Native American Jewelry? I have quite a collection, and can’t wear all pieces all the time. Is is okay to store them in airtight zip lock bags for any length of time? I only use polishing cloths to clean the jewelry, but air exposure really causes tarnish to return quickly, especially in the South, where humidity is a large factor. Enjoy and appreciate the free education you give to us all. Thank you. I have written quite a few – in the search bar at the top of every page, enter either “JEWELRY STORAGE” OR “JEWELRY CARE” and you will get a list. Here are a few.